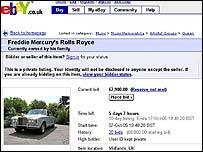 Rock legend Freddie Mercury's silver Rolls-Royce car is being auctioned on the internet site eBay by the late star's sister. The Silver Shadow luxury vehicle has already attracted bids of up to £8,400. It comes with an unused box of tissues the singer always stored in the car. The car, last seen at the 2002 London premiere of the Queen musical We Will Rock You, has had occasional use. The Queen lead singer and main songwriter died in 1991, aged 45. The flamboyant singer kept a box of Kleenex Mansize Tissues tissues in the car, which his sister Kash could not bring herself to remove when she was given the Rolls-Royce. The 1974 model, which has a grey leather interior with wood trim, contains a car phone and a radio cassette player. 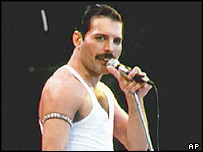 The Queen frontman died in 1991, at the age of 45, from an Aids-related condition.